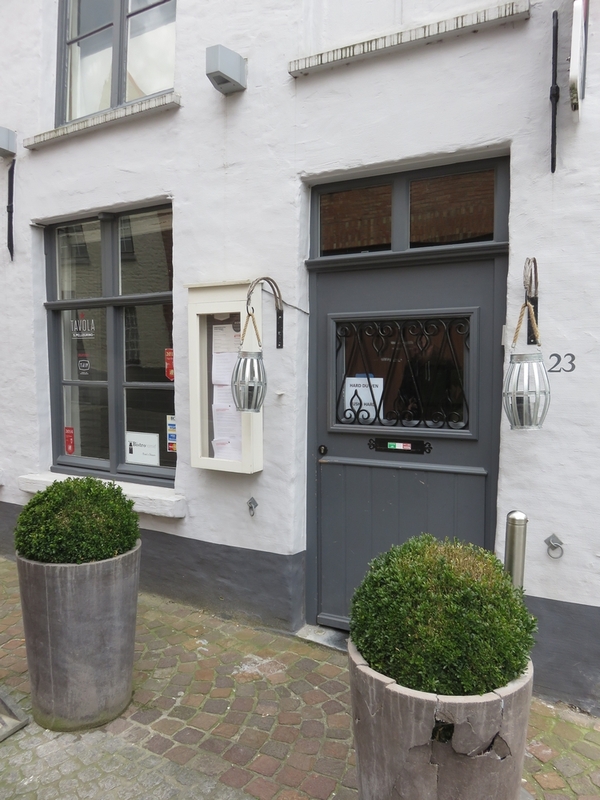 Restaurant review #80 – A couple of weeks ago, we visited restaurant Tom’s Diner in Bruges. 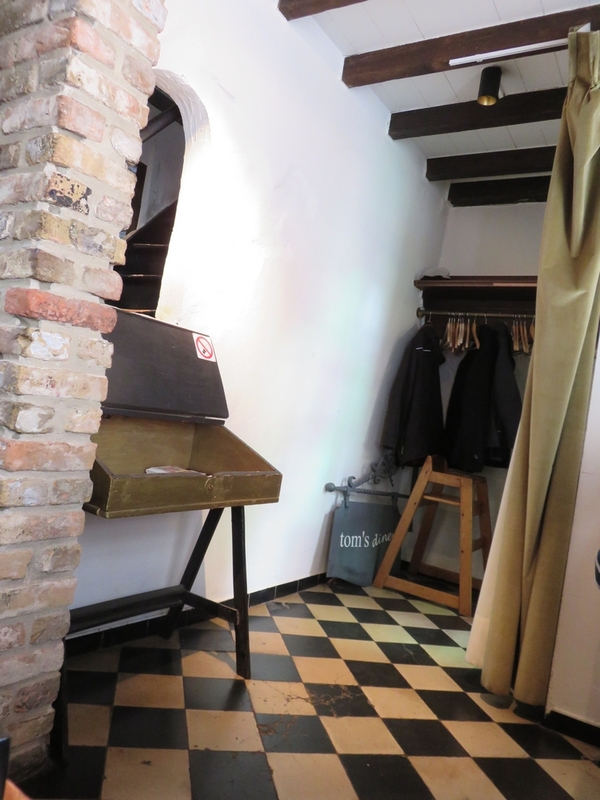 It is located in one of the small alleys on the north side of town, just above the Augustijnenrei. There are no vegan options standardly available. Long time ago I had mailed them to request if vegan was possible, and then received a positive reply. 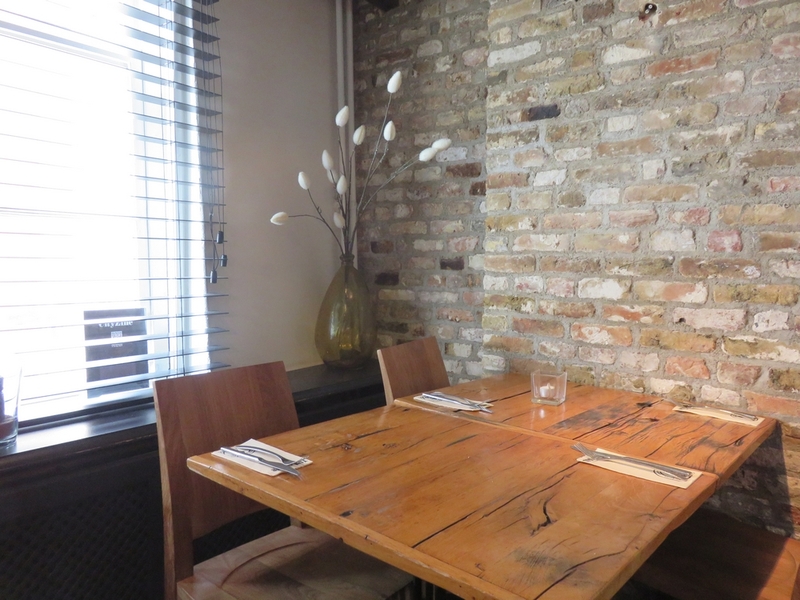 So I phoned the day before we wanted to go to make the reservation for two for a vegan menu, and vegan was said to be no problem (and to be sure I repeated again: no animal ingredients, etc). The lady on the phone even seemed very enthousiastic about it! It sounded promising! 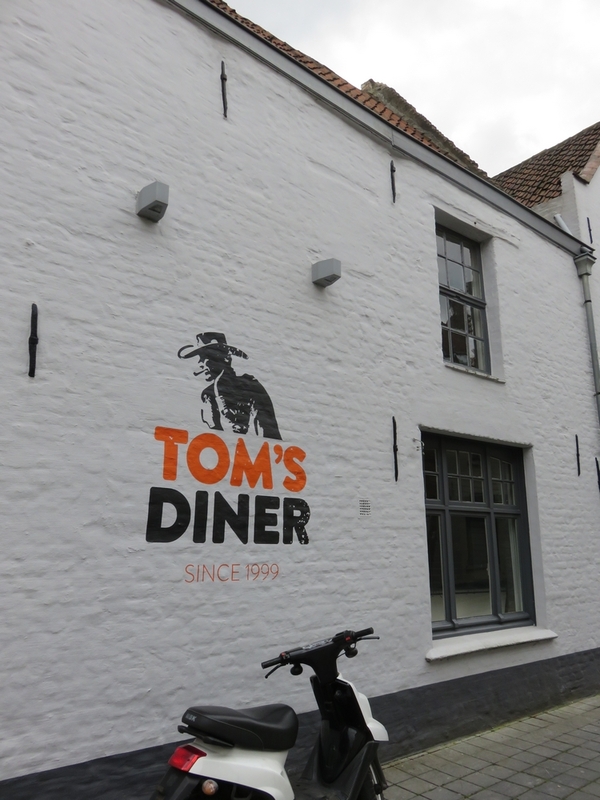 We arrived at Tom’s Diner for lunch and were seated at a small table near the entrance. 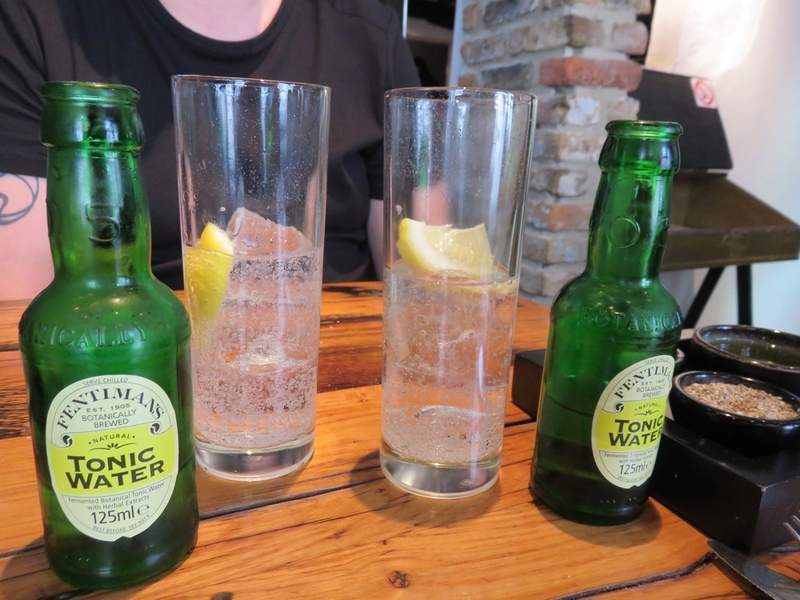 The waiter seemed very taken by surprise when we repeated that we had asked for a vegan menu. He asked whether we just wanted one dish? I repeated that I had requested a vegan menu. He went back and forth to the kitchen, where we also heard ‘no no , that also means no eggs’. He came with bread and butter, and we asked to take it away and have some olive oil instead. We were starting to get a bit anxious. Our only option as a starter were the patatas bravas without the sauce (7,50€). So we asked if we could have a vegan sauce with that, and so it came with charissa with ketchup. 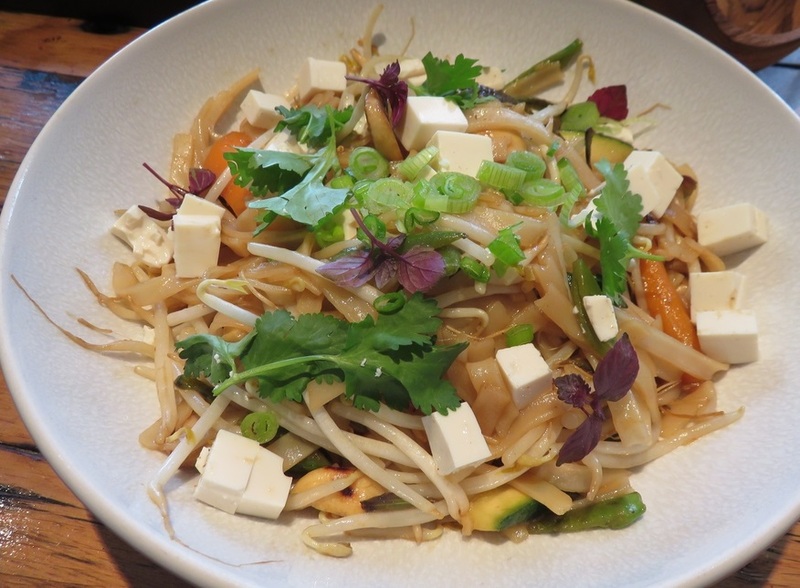 The main dish which was proposed was noodles (checked if they were eggless) with tofu and vegetables (17,50€). 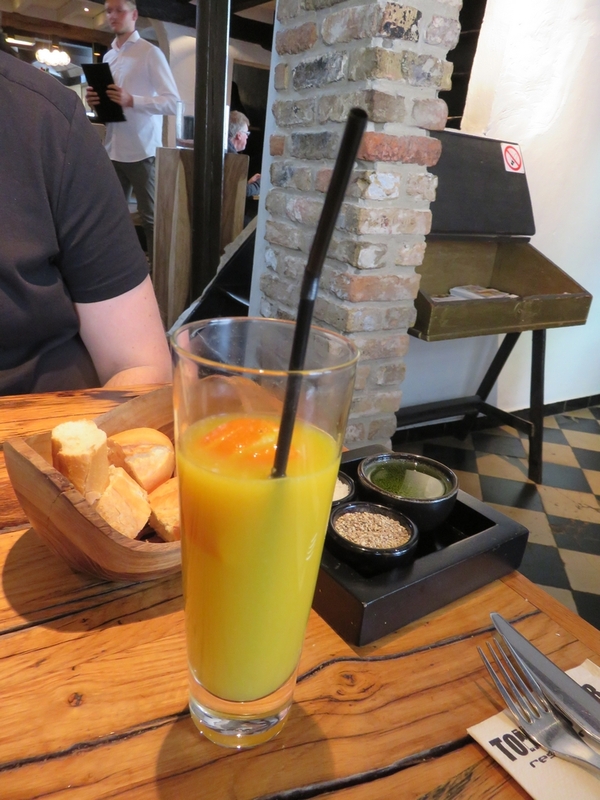 For drinks we had and orange juice (2,50€) and tonic (2,50€). 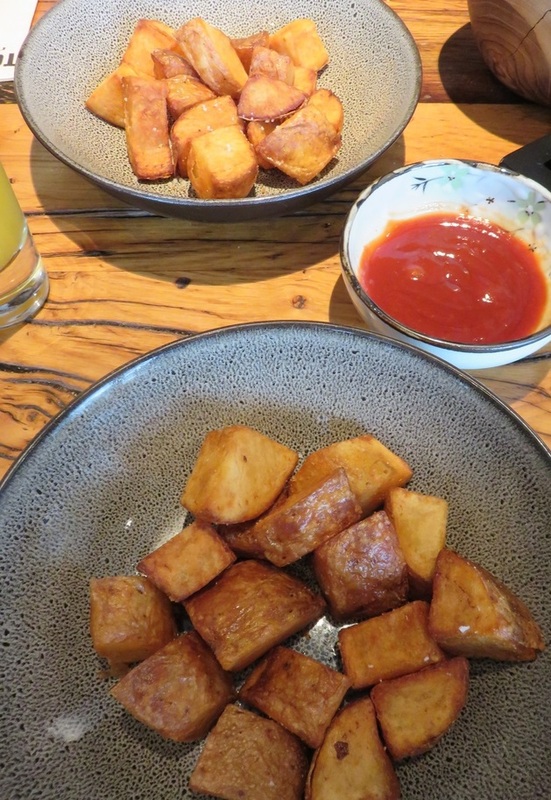 The patatas bravas were just baked potatoes. We each had a portion, and this was very monotone. The noodles came with raw (and lukewarm) tofu. It seemed to come straight from the package. 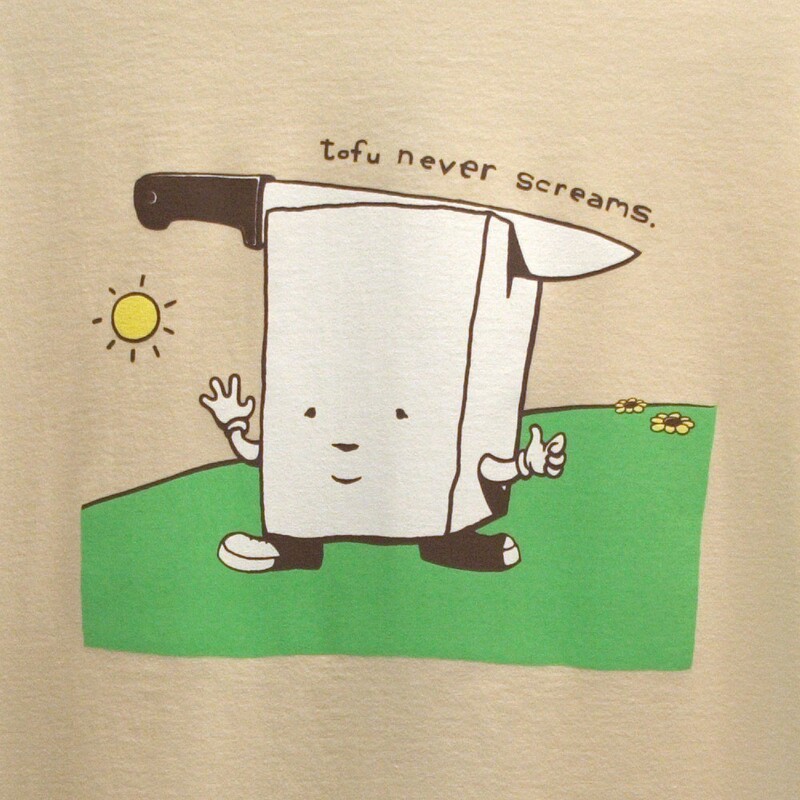 Tofu never screams, but if I ever get served raw tofu again, I’m going to scream. Really. We asked if there were any vegan desserts. The waiter said he would have to check with the kitchen, in a very reluctant manner. So we did not bother and just ordered a coffee. 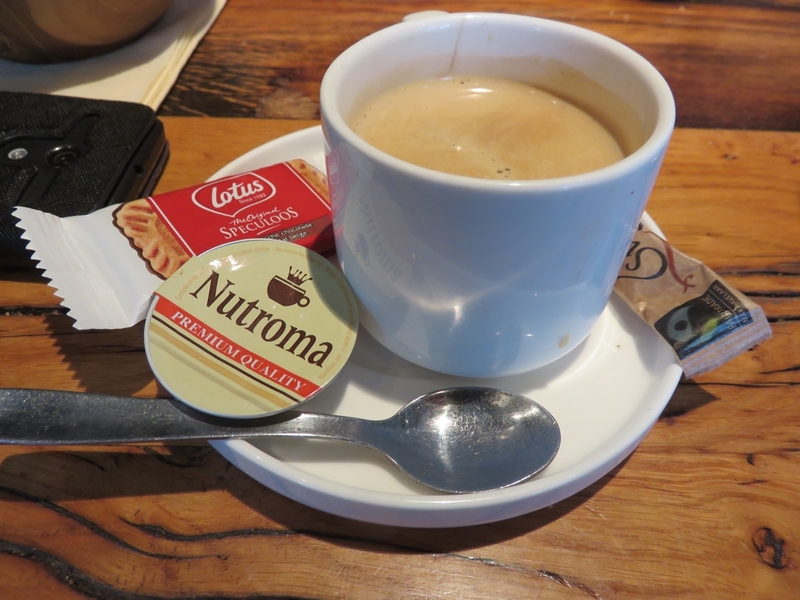 And yes, for sure it came with milk and a non-vegan cookie (2,30€). Tables are closely together and seatings were not really comfortable. 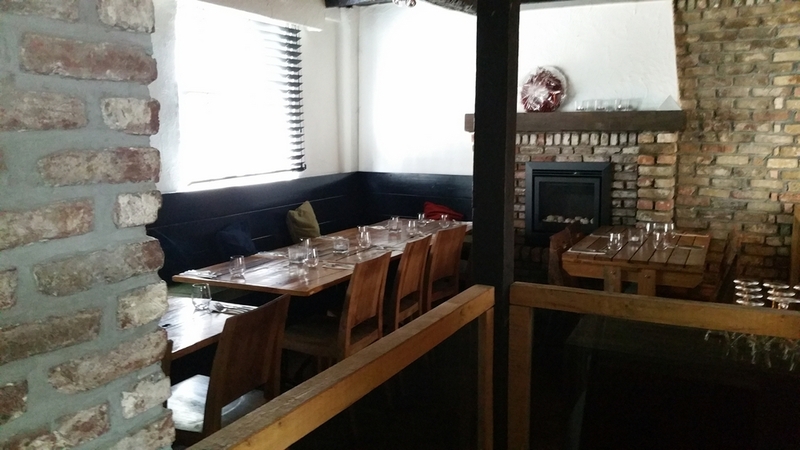 There is seating upstairs as well (beware of steep stairs). 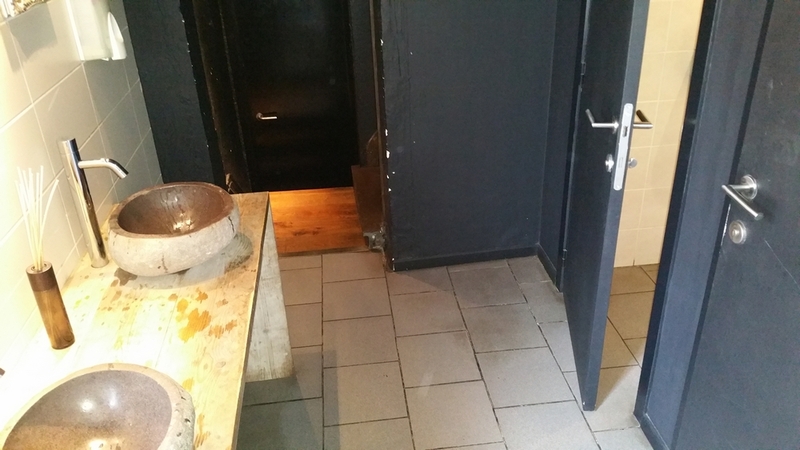 Toilets are also upstairs, and gave a bit of a messy impression. Our lunch at Tom’s Diner was really underwhelming and we left disappointed. Both dishes (the starter and main dish) were way overpriced and gastronomically disappointing. In case you end up here with others for a business lunch, family dinner or with friends, it’s good to know they can make a vegan dish. But we don’t feel it is worthwile visiting specifically for the vegan option. What a joke. I will never go there. They are still living in the 20th century. Rarely do I eat out, but when I do, this is much of what I encounter. But of course this is America, mid-west, it is to be expected. Although there are hints of change occurring. 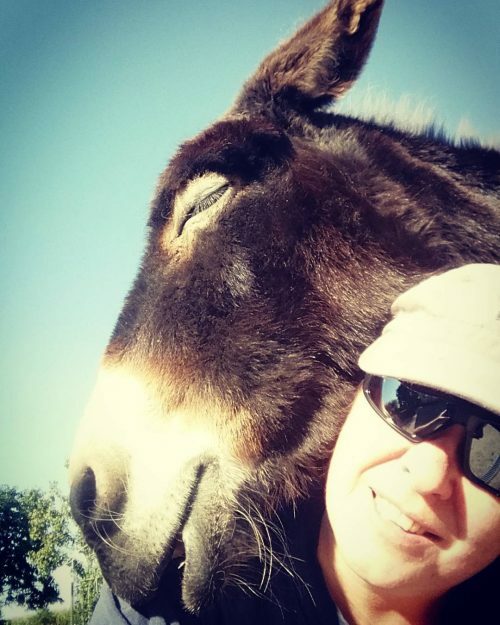 For example, we have our very own vegan jerky made right here in Louisville Kentucky. http://www.lvjco.com/ Cool, eh? Great to see you’re back online Peter 🙂 That vegan jerky looks fabulous. I might try and make something like this (we now have a dehydrator, so will do some experimenting 🙂 ). We agree, 17,50 for the main dish was way overpriced. Although there were some cashews in there too 😉 , but still! The regular speculoos Lotus cookies indeed don’t have animal ingredients, but if I recall correctly this one was with chocolate (milk). Not a place I’d ever want to go to. I only clicked “like” because of your review; thumbs down for Tom’s Diner. Wow. So sorry you had such a disappointing visit.